You can make this recipe in the oven if you don’t have a barbecue, however you won’t get the delicious smoky flavour. If you are going to use the oven instead then cook at 180°C for 1hr 20 minutes or until the juices run clear. Don’t forget to stand the chicken on a roasting tray if you do cook it this way otherwise you will have one messy oven to deal with afterwards. This recipe is definitely worth a go if you are having friends over this weekend, just serve with some barbecued veggies or a couple of big salads. Enjoy! This entry was posted in bbq, chicken, main meal and tagged bbq, food, foodblogger, foodphotography, homecooking, recipes on July 15, 2016 by Antonia Cooks. I am back in France at the moment at my parent’s house and it is bliss, not only has the weather been magnificent but a lot of fruit and vegetables are in season at the moment which means every meal has been a delight! I think lunchtime is my favourite meal as it always starts off with a little melon served with some of our home reared cured ham, followed by a huge salad a cheese board that is to be envied and to finish apricots picked straight from the tree. Food does not get much better than that! As it is the perfect weather for a BBQ yesterday morning I headed to the market to see what I could find to cook for supper. I ended up coming back with various bits and bobs but the two things that I was most pleased about were the prawns and samphire which I was going to use to make a very simple starter. For those of you who have not come across samphire before it is a sea vegetable that grows abundantly on shorelines. It has a crisp texture and a delicate salty yet slightly buttery flavour which means it works beautifully with seafood. The idea of this starter is to let the prawns and the samphire do all the talking and to keep it very simple. Provided your BBQ is hot and ready to cook on this starter takes roughly 10 minutes to make and there is really nothing to it all you need is a few skewers and a little tin foil. (1) Wash the samphire and then place on a sheet of tin foil with the butter, create a parcel out of the tin foil and set to one side until you are ready to place it on the BBQ. (2) Wash your prawns then place them on to a wooden skewer (2-3 prawns on each skewer). Note: always soak wooden skewers in water for about an hour to stop them burning when you place them on the BBQ. (3) Once your BBQ is hot enough to cook on, place your tin foil parcel on the BBQ and let it cook for 5 minutes before you place the prawn skewers on the BBQ, cook on each side for about 3 minutes or until the prawns have turned pink. 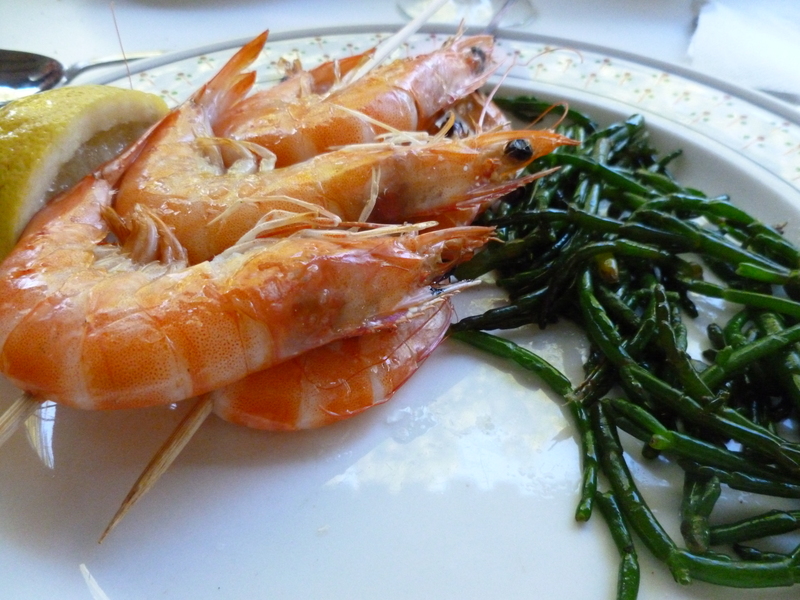 (4) As soon as your prawns are cooked, serve the prawns and samphire with a wedge of lemon. Enjoy! This entry was posted in bbq, fish, main meal, quick & easy, recipes, side dish, starter and tagged bbq, eatclean, eats, foodblogger, foodie, healthyeating, recipes on July 18, 2014 by Antonia Cooks. A few years ago I dropped in on Jones and her parents in Shropshire and I was treated to Papa Jones’ chilli beef burgers and they were pretty special. 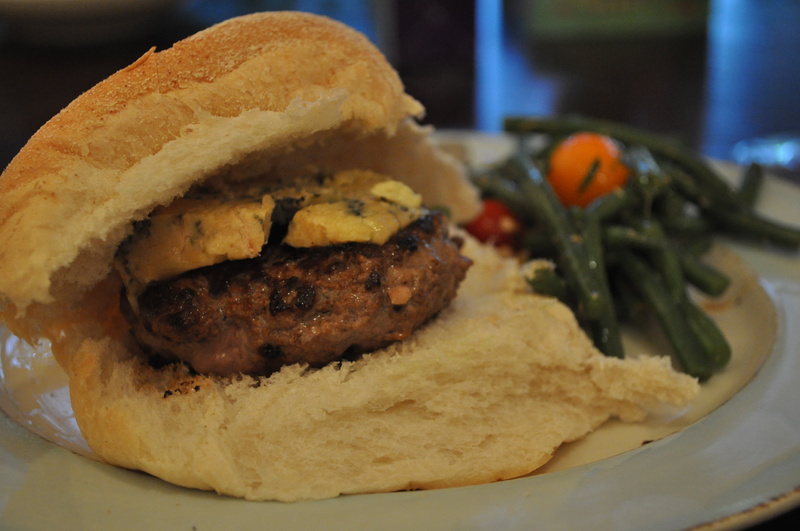 Last week I thought I would see if I could recreate them, given that we had an abundance of burger buns in the freezer. With BBQ season coming up quick and fast these burgers are a great option and can be made up well in advance and will keep in the fridge if covered in cling film for a couple of days. This is definitely a recipe to try. Enjoy! Place all the ingredients in a bowl and mix together well (it is much better done with your hands). Shape the mixture into 6 equal sized balls. Heat a little oil in a heavy based frying pan. 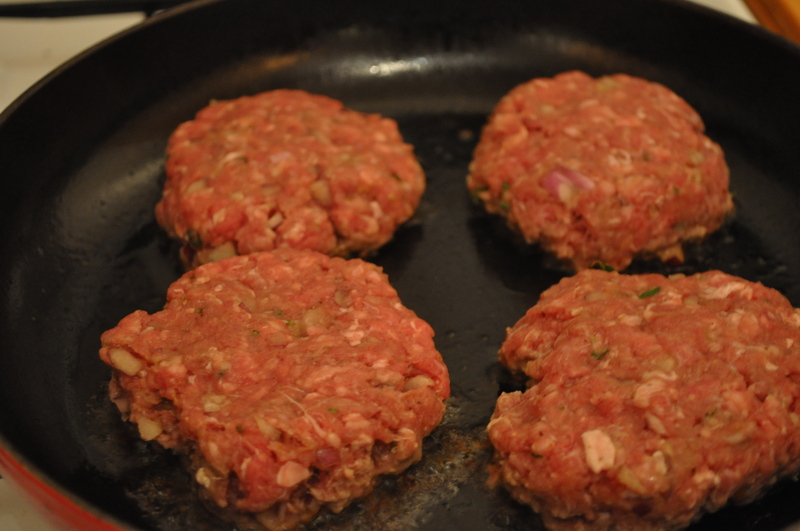 Place the meat balls in the pan, using either your hand or a spatula to flatten out your burgers, till they are roughly ¾ of an inch thick. 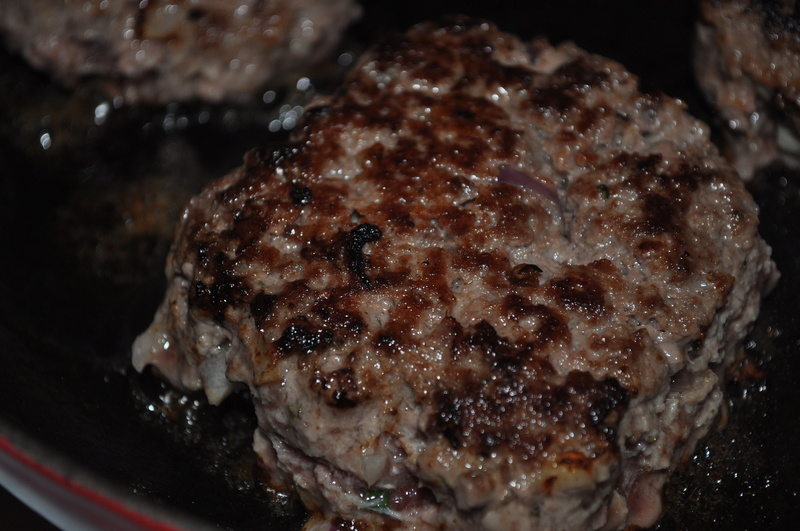 Cook your burgers for roughly 3-5 minutes on each side. Serve, in a burger bun with a side salad. 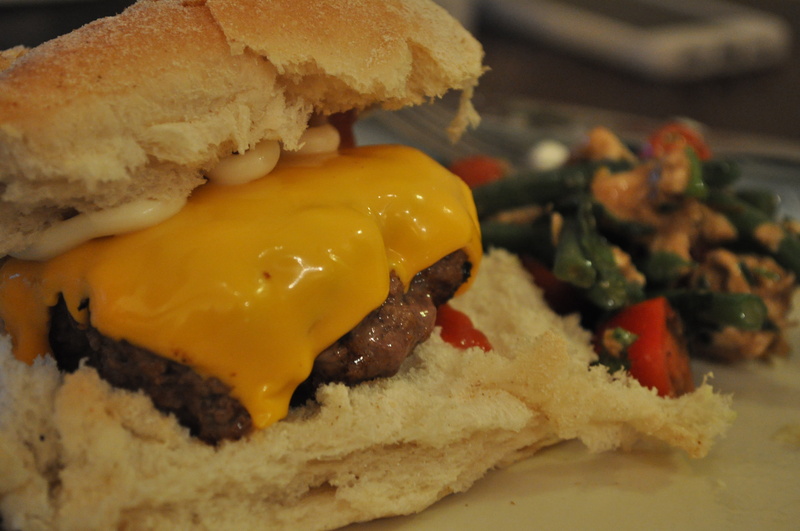 Tip: If you are going to serve your burger with cheese, just before removing the burger from the pan place the cheese on top of your burgers so that it melts slightly. This entry was posted in bbq, beef, cheese, main meal, quick & easy, recipes and tagged bbq, eatclean, food, foodblogger, healthyeating, homecooking, instayum on April 24, 2014 by Antonia Cooks. It is so hot outside – the heat-wave is well and truly here! Right now I think it is about 41C outside, subsequently, having a BBQ for lunch was really the only option. All the family are here this week, which means big quantities of food are needed. Having raided the deep-freeze last night for various types of meat, this morning all I had to do was make some marinades. Deciding what marinade for the chicken would be was a no-brainer – honey and mustard is a classic marinade we have used on chicken legs for years, because the honey caramelises so nicely on a BBQ. The more important question was what to marinade the spare ribs in? I woke up this morning thinking some sort of Chinese plum sauce might be nice, but unfortunately we didn’t have any already made up, so I decided to try and make it. 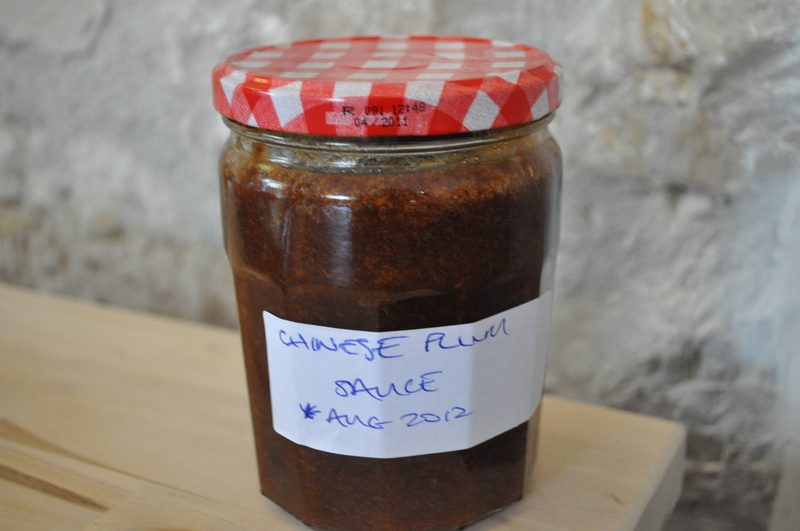 The result was a sticky plum sauce that worked really nicely. To balance out the vast quantity of meat I decided that vegetable skewers might not be a bad idea. Aside from the plum sauce that took about an hour to make (but now that’s done I have 7 big jars of the stuff ready for use later in the year) the rest of the preparation for the BBQ took no time at all. I am pleased to say that there was hardly any scraps left over from the BBQ other than a few bits of salad, so all in all a job well done by all members of the family. Place all the ingredients in a large sauce pan and mix well together, place on a medium heat and bring up to the boil. Leave on a rolling boil for roughly 40 minutes, stirring occasionally to prevent the fruit catching on the bottom of the pan. After boiling for 40 minutes – remove from the heat and allow to cool a little before blending the mixture with either a handheld blender or a liquidizer. Place back in the pan and bring back up to the boil. Leave the sauce to boil for roughly 5 minutes before placing in sterilized jars. Preheat your oven to 160C fan. Place ribs on an oven tray and pour over half the plum sauce, making sure that each rib has got the sauce on each side. Cover with tin-foil and place in the oven for 40 minutes. Remove from oven and set to one side until your BBQ is hot. 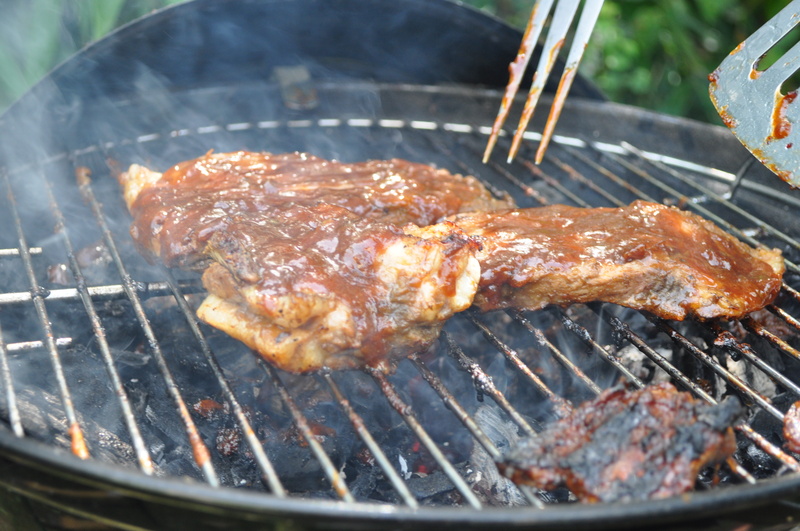 Once your BBQ is ready, place the ribs meat side down and place some of the remaining sauce on the back of the ribs, let the ribs cook for about 3-4 minutes or until nicely caramelised, then turn over and do the same again. Just before you are ready to serve turn the ribs one last time and cook for just a minute. Mix together the honey and mustard in a bowl. Place the chicken on an oven proof dish and pour over the mixture, making sure that all of the legs are coated. Cover with tin foil and place in the oven for about 20-25 minutes. Remove the tin foil and cook for a further 5-10 minutes until the chicken is cooked or the juices run clear. 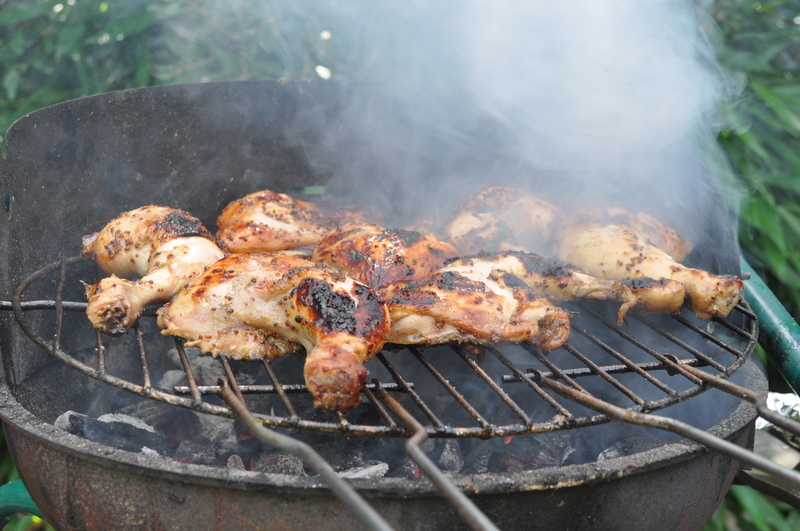 Once your BBQ is hot place the chicken legs on the BBQ for 4-5 minutes on both sides to give it that nice BBQ flavour. Cut all the vegetables into bit sized chunks and place in a large dish. Squeeze over the juice of the lemon, scatter over the coriander leaves and garlic and finally pour over the olive oil. 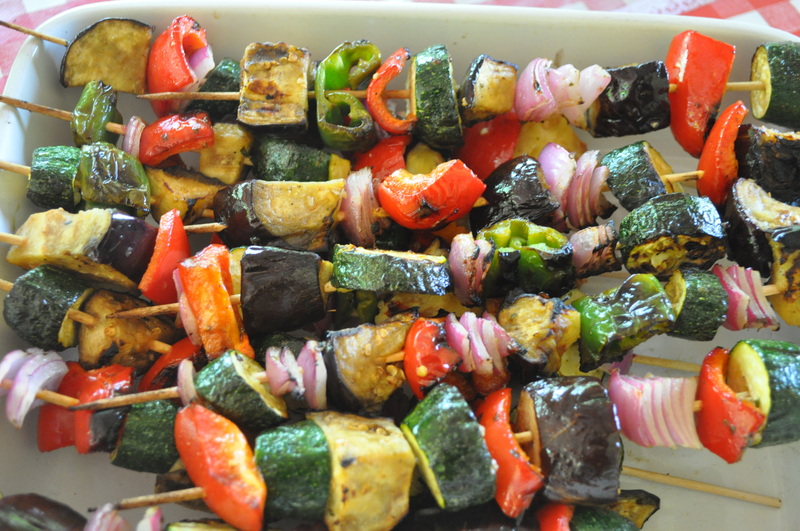 Mix everything together well and then make up your skewers ordering the vegetables as you please. Once your BBQ is hot place on your skewers, turning them regularly so that they don’t burn and cook for roughly 15 minutes.